Yamla Pagla Deewana Phir Se Dialogues- Get funny and best dialogues from Yamla Pagla Deewana Phir Se. This is an action comedy film, directed by Navaniat Singh. This is a sequel of Yamla Pagla Deewana film which was released in 2011, Yamla Pagla Deewana 2 is the second film of this series and released in 2013. 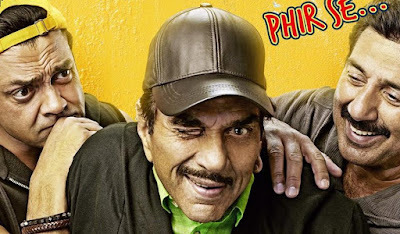 The teaser of Yamla Pagla Deewana Phir Se has released now, This is really awesome. Some comedy scenes are really amazing with funny dialogues. This is the completely new story. Dharmendra, Sunny Deol, and Bobby Deol are playing the main lead role and Kriti Kharbanda is playing the female lead role. Salman Khan is in a special appearance. Here we have collected some best funny dialogues, lines from Yamla Pagla Deewana Phir Se. I hope, you will like my post. "Kem chho...Maja maa...barobar chhee..saaru chhee...Daaru chhe"